 Mouse anti Human HLA DP DQ DR antibody, clone Bu26 reacts with DP, DQ and DR beta chains, which are expressed by antigen presenting cells, B cells, monocytes and activated T lymphocytes. The major histocompatibility complex (MHC) is a cluster of genes that are important in the immune response to infections. In humans, this complex is referred to as the human leukocyte antigen (HLA) region. There are 3 major MHC class II proteins encoded by the HLA which are HLA DP, HLA DQ and HLA DR.
Chapple, M.R. et al. (1990) A phenotypic study of B lymphocyte subpopulations in human bone marrow. Clin Exp Immunol. 81 (1): 166-72. Forte M et al. (1992) T-lymphocyte responses to Pneumocystis carinii in healthy and HIV-positive individuals. J Acquir Immune Defic Syndr. 5 (4): 409-16. Knox, P.G. & Young, L.S. (1995) Epstein-Barr virus infection of CR2-transfected epithelial cells reveals the presence of MHC class II on the virion. Hassell AB et al. (1992) MHC restriction of synovial fluid lymphocyte responses to the triggering organism in reactive arthritis. Absence of a class I-restricted response. Clin Exp Immunol. 88 (3): 442-7. Kumararatne, D.S. et al. (1990) Specific lysis of mycobacterial antigen-bearing macrophages by class II MHC-restricted polyclonal T cell lines in healthy donors or patients with tuberculosis. Clin Exp Immunol. 80 (3): 314-23. Shokri, F. et al. (1993) Immunophenotypic and idiotypic characterisation of the leukaemic B-cells from patients with prolymphocytic leukaemia: evidence for a selective expression of immunoglobulin variable region (IGV) gene products. Leuk Res. 17 (8): 669-76. Pithie AD et al. (1992) Generation of cytolytic T cells in individuals infected by Mycobacterium tuberculosis and vaccinated with BCG.